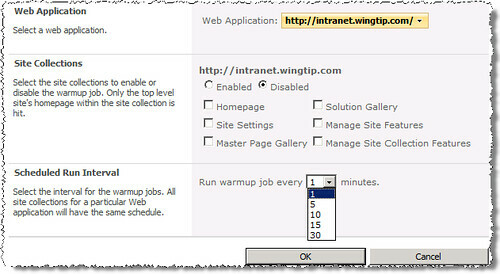 For those of you who are familiar with my SharePoint Warmup Job utility from SharePoint 2007, this is the new version rewritten for SharePoint 2010 that fixes some bugs & adds a few new features. Those of us who present, demo or teach SharePoint 2010 have something in common. SharePoint is like any other ASP.NET application in that the first time you hit a page it has to JIT compile the page. Once that's done, subsequent page hits are nice and quick as the JIT compiled page is cached. That is until the IIS application pool is recycled, something those of us SharePoint developers do a lot. The other challenge is that when we present, demo or teach, we might not be in one site for a while, but we want it to "stay alive" like people are using it. I've created a utility that at scheduled intervals will issue an HTTP/HTTPS request to a specified site collection's homepage, key galleries and key admin pages. This way while presenting, demoing or teaching, you can ensure that the most common pages in your sites are being warmed up and kept alive so when you go to do your demo it's nice and quick. This page will allow you to select a Web application and then specify which site collections you want to keep warmed up and alive. You can optionally pick which popular pages you want the job to hit and the frequency they are hit. I've tested this in both the public SharePoint 2010 beta as well as the not so public Release Candidate. So far everything works as expected. Got any feedback on more features? Leave a comment on this post. You can download the utility from the Critical Path Training Members Only section (look in the Code Samples section). You'll need to be logged into our site to download it, but membership is free! 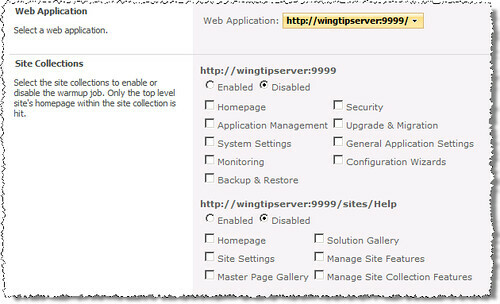 [Update June 7, 2010] Updated to include extra logging in the SharePoint ULS and event log and fixed a few bugs. Details here.